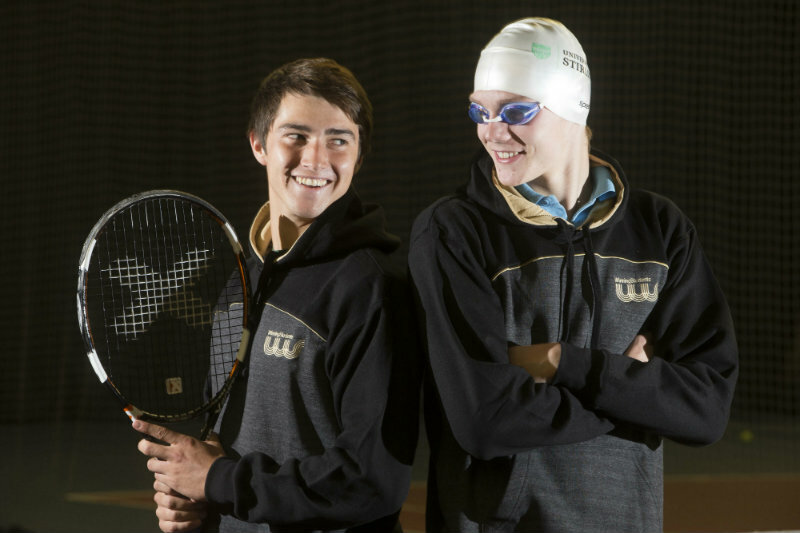 Namesakes: Tennis player Scott Duncan, studying Sport and swimmer Duncan Scott, studying Business and Sport. Photo: Jeff Holmes. Leading sporting talent studying at Scottish colleges and universities has been boosted by a £2.4 million funding investment. National student sports scholarships Winning Students - managed on behalf of the sector by the University of Stirling - will continue to support the brightest and best athletes after investment from the Scottish Funding Council was confirmed for the next four academic years. Current athletes include Commonwealth Swimming Champion Ross Murdoch and British Indoor and Outdoor 1500m Champion Laura Muir. Eighty-two athletes at Glasgow 2014 received scholarship support and their collective 16 medal haul placed the programme equivalent to 14th on the medal table. Education Secretary Angela Constance met a number of athletes at the University of Stirling and said: “Scotland’s performance at Glasgow 2014 was nothing short of phenomenal and Winning Students played a significant part in this record performance. “By ensuring the cream of the crop are able to combine their studies with their sport of choice, Scotland is getting the best of both worlds – sporting success with the athletes well placed to maximise their potential in academia or the workplace. Ross Murdoch won Gold and Bronze swimming medals at Glasgow 2014 and has since added four European Championship and two World Championship medals to his collection. He said: “The support from Winning Students has been invaluable. It is tailored to your own needs and it has helped me to balance my studies and my training. I always wanted to have a degree behind me at the same time and the flexibility the Winning Students scholarships provide has been equally as important as the funding in enabling me to do both well. Professor Gerry McCormac, Principal and Vice-Chancellor of the University of Stirling, added: “The University of Stirling is delighted to continue to deliver the highly successful Winning Students scholarship programme on behalf of the sector. Winning Students has a proven track record of success in helping athletes work towards their sporting goals whilst also completing high quality degrees. Laurence Howells, chief executive of the Scottish Funding Council, also said: “Winning Students has been a fantastic success with more than 300 students benefitting since it began and I am delighted to continue SFC’s support. Find out more about Winning Students. Winning Students provides athletes competing at the highest levels with funding support and academic flexibility enabling them to develop in their sport while pursuing their studies. More than 300 students studying across 31 colleges and universities have received support since the scholarships were first established in 2008. The programme works closely with the sportscotland institute of sport to ensure funding is tailored and effective. Graduates include Ladies European Tour golfers Pamela Pretswell and Kelsey MacDonald, Walker Cup golfer Jack McDonald, swimming sensation Hannah Miley and Badminton ace Imogen Bankier. Winning Students has also supported the establishment of national training centres including the Scottish FA Performance Centre for Women’s Football. A recent study found its graduates experienced lower levels of unemployment and higher salaries for first degree graduates in full-time employment.